Annual since the year 2000 the Autostadt in Wolfsburg, Germany celebrates annually a winter event of several weeks on the premises of the VW theme park. For this event the 125 metres high chimneys of the landmarked power plant are illuminated in saturated red, symbolising huge candles. 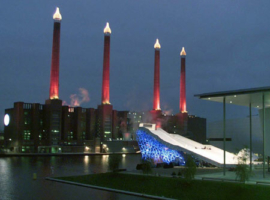 For the façade illumination the client trusts in the experience and know-how of the lighting specialist AO Lighting. 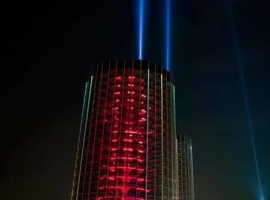 Additionally to the façade illumination searchlights are used to set accentuation by light above the premises of the Autostadt. 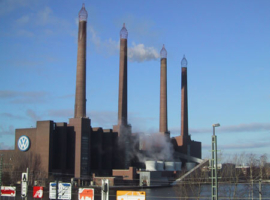 In the year 2001 the lighting designer Max Wehberg contacted the lighting specialist with the special wish not only to illuminate the four chimneys of the VW plant in red but also, as a special highlight, to install four candle flames illuminated in yellow on the top of the chimneys. 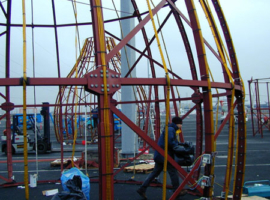 The project with the candle domes was realized by AO Lighting as general contractor within the short-term lead time of only four weeks. 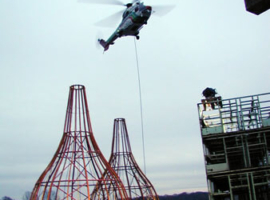 Under the general direction of Marco Niedermeier, a team of structural designers and engineers designed the most gigantic candles of the world. 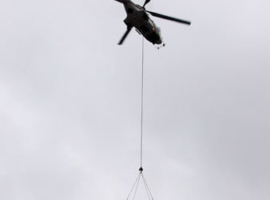 On twelve special transporters the parts of the candles arrived at the VW plant in Wolfsburg where an eighty man team was ready to assemble the candle tops. 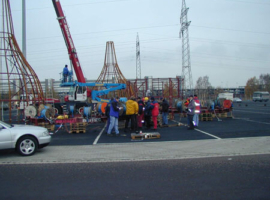 Special cranes, scaffolds and heavy implements were required for mounting the steel candles and the fixing of special rope light at the steel construction. 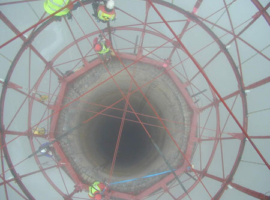 The four candles were about 15 meters high and had a total weight of 30 tons. 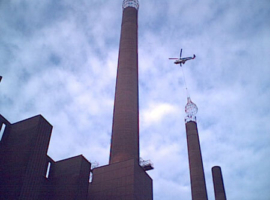 With the assistance of a special helicopter they were mounted on the four chimney tops. 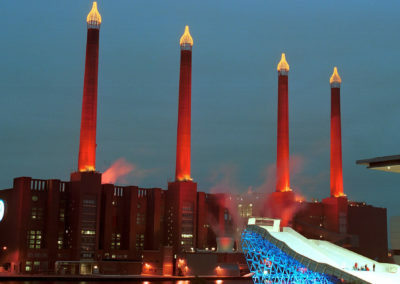 On time for the first advent the first huge advent candle blazed with its candle flame above the rooftops of the VW Autostadt.Architectural floodlights of the FALCON Range were used for the façade illumination of the chimneys. FALCON xenon searchlights set highlights above the rooftops of the car park. 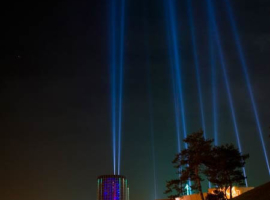 All searchlights were controlled automatically by a central e:cue lighting control desk. The networking of the fixtures occurs by wireless DMX radio links. 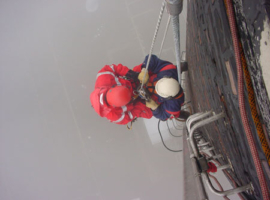 This enables a synchronized control of all searchlights with only one single transmitter. 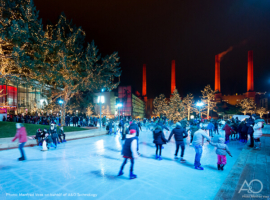 Approximately 50.000 visitors come annually to the coveted winter event on the premises of the Autostadt. 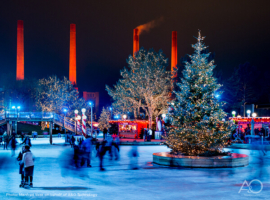 This permanent institution at Christmas time in Wolfsburg achieves each year a huge worldwide media coverage. 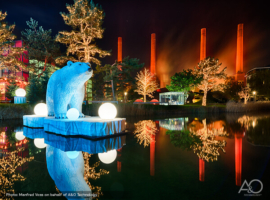 Since 2015 the Autostadt has scaled new heights with its illumination by using sustainable plasma technology made by AO Technology to light up the iconic chimneys. 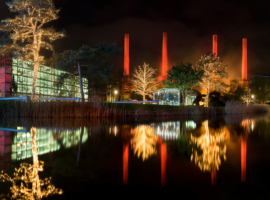 What must be the world’s largest Advent candles – in the shape of the chimneys of the old power station in the Autostadt Wolfsburg – are now being lit using pioneering and sustainable luminaires from AO Technology. 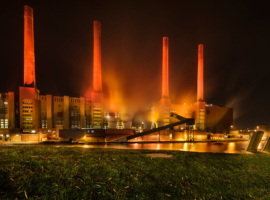 With its investment in German-made FALCON® SPELIA Arc plasma floodlights, the Autostadt is not only setting new standards in terms of eco-friendliness but also achieving an energy saving in the illumination of the power station of around 75%. Year in, year out. 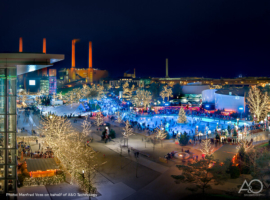 This is now the 15th year in succession that the Autostadt Wolfsburg has transformed its theme park during Advent into a winter wonderland. 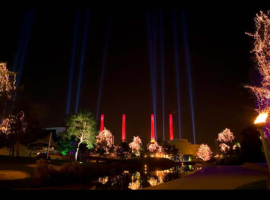 The magical set is dominated this year, as always, by the historic chimneys, bathed in red light to look like giant candles. 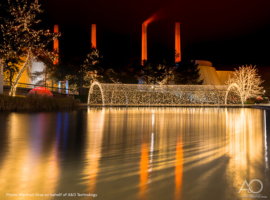 This year, the Autostadt has scaled new heights not only with the overall concept of the Winter Wonderland but with its illumination, making use here for the first time of AO Technology’s sustainable plasma technology to light up the iconic chimneys. “We are going beyond architectural lighting to venture into new markets and will be presenting some amazing new products at the Light+Building,” says Marco Niedermeier, AO Technology’s CEO. 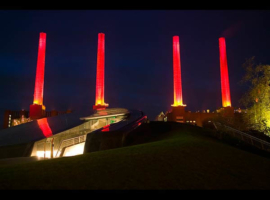 The lighting specialist has been responsible for the winter illumination of the chimneys now for 15 years but has come up with a first this year: for the first time, the innovative products of the FALCON SPELIA Arc series are being exposed to sustained use. 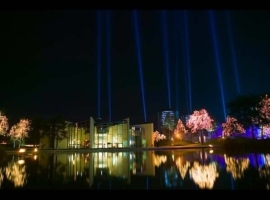 “In pursuit of an efficient, environmentally friendly and economical lighting strategy, we had already tried lighting solutions ranging from LED to xenon,” relates Christian Kiel, TIM/Director TEM, the Autostadt’s Events Management Technical Director. The searchlights employ sulphur-plasma technology. With their optimal lumen-to-watt ratio and above-average working life of up to 50,000 operating hours, they constitute an ideal solution for architectural applications. 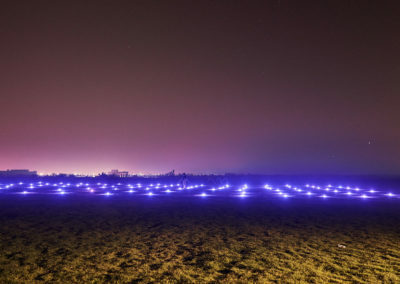 The continuous light spectrum of the SPELIA plasma searchlights, which come closer to sunlight than any other artificial light source, has been modified here in terms of colour tone using special dichroic filters to achieve the red hue typical of Christmas lighting. 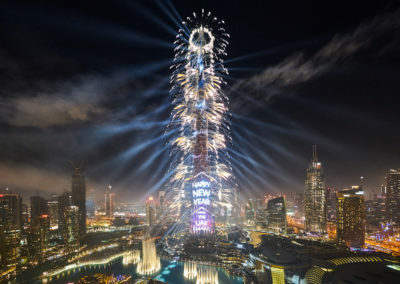 With 48 plasma searchlights in all realizing an even 360° illumination, the 128-metre towers are being bathed this year in a deep red. Each Sunday in Advent, a new candle is being lit, until by the fourth Sunday, all four chimneys will be lighting visitors the way to 2016.